You’ve probably heard or read about Amazon drones some time in the last day or so, whether it was on your Twitter feed, on the Dan LeBatard Show, your coworker was taking a poll on the subject, or you watched Amazon CEO Jeff Bezos’ interview on 60 Minutes. I’m a very serious online shopper. A professional deal-seeker (I got a Christmas tree that’s normally $200 for $69 for the SmallBox office). A few steps away from an Extreme Couponer (not really, but I kind of wish I were). Let’s just say that during the marketing team’s weekly meeting I occasionally clicked through Amazon’s Cyber Monday flash deals (sorry!). Are Amazon delivery drones cool or creepy? 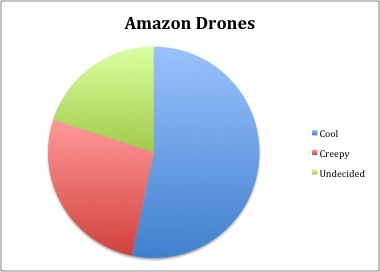 SmallBoxers mostly agree that Amazon drones could be awesome. Eight votes say that Amazon drones are probably really cool. Four ‘Boxers said they’re creepy, and three had mixed feelings. Musical Family Tree’s Jon very well considers the delivery drones “the next step towards the Apocalypse.” I say, the Apocalypse is inevitable, so who cares? Jon called me a defeatist. Tyler thinks people might start snatching drones for keeps in mid-delivery. Kasey says he would, and then continue to fly it off in to the sunset. Jason says the idea is cool, and he respects that Amazon is even trying it out – but he’s equally irked. Sara‘s feelings are also mixed; she admires the convenience Amazon provides to its customers but abhors their practices. How does the idea of your order dropping in your yard in 30 minutes (we do have a warehouse super nearby in Zionsville!) sound? Or… are you just not about that life? This entry was posted in Personal, Think Kit and tagged Think Kit. Bookmark the permalink.